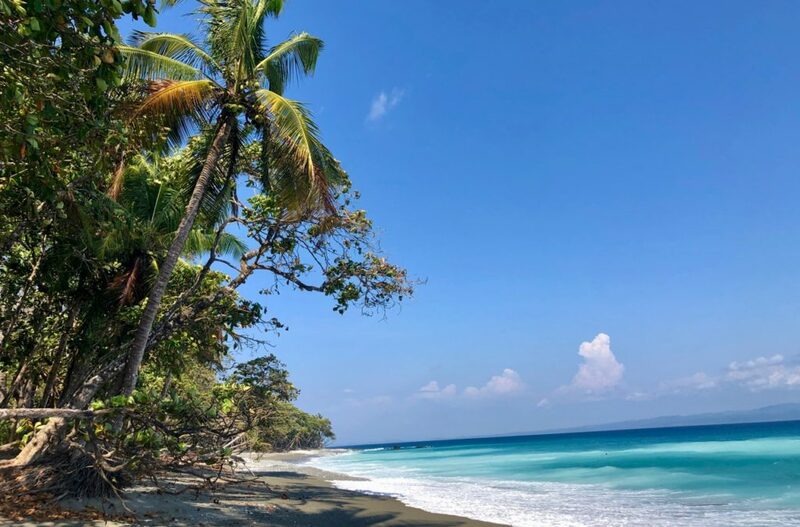 Looking for the best beaches in Costa Rica is like trying to find the the most spectacular jewel in Aladdin’s Cave of Wonders: an impossible task, but an exciting one. Costa Rica is home to beaches galore and plenty of stretches of coastline where palm trees meet sparkly sand and shimmery waves. No matter what you seek, Costa Rica serves up a beach just for you. Some of these beaches are great for surfers, some are good for swimming, some have an undertow so fierce I wouldn’t let my kids near the water, and some feature monkeys who will steal your lunch. Exploring the beaches of Costa Rica in order to identify the very best family-friendly beaches was a tough job, but somebody has to do it…so we did. You’re welcome. 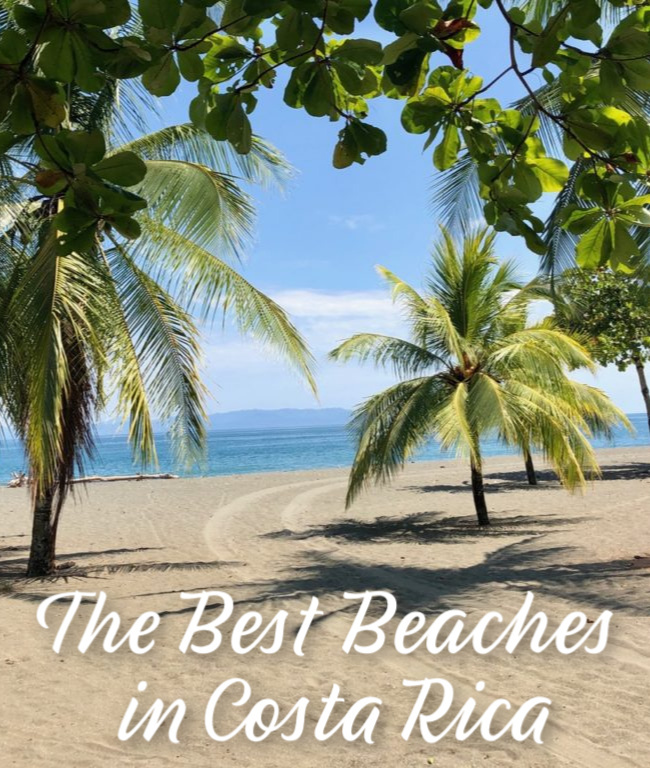 Below you’ll find the best beaches for each region as well as a map showing you where to find them, since beaches in Costa Rica don’t come with addresses. Then keep reading to find out how we found our favorite beach of all! If you’re thinking Playa Dominicalito looks like a perfect place to plant you and your family, you’d be right. This beach is consistently rated as one of the best in the country, and one of the most visited, as well, so don’t expect to be alone. To visit, you’ll have to enter Manuel Antonio National Park, and then walk about 30minutes. You won’t mind, though, because you’ll be looking at abundant wildlife along the way: monkeys, sloths, iguanas, and wide variety of birds call this park home. Playa Manuel Antonio can be crowded, but that’s just because so many people want to see its stunning beauty. Thick jungle, with monkeys hanging from the trees, backs up to a white-sand beach and turquoise waves. I hiked to this beach with a 4-year-old and a 20-month-old (yes, there was crying involved…mostly me, but sometimes them too), and it was still totally worth it. Dominical is famous for its hippie surfer vibe. The beach at Dominical was changed a few years ago by Hurricane Nate and is now rockier close to town than it used to be; however, it continues to host surfing competitions and is a good place to find surf lessons as well. The long, gentle slope of beach makes it great location for surfers of all skill levels. There are lots of good little restaurants in Dominical. Our favorite is the fish taco place El Pescado Loco. The wide beach in front of town hosts artisans selling their wares, and this is my kids’ favorite place to shop for souvenirs. T-shirts, towels, wooden carvings, and lots of shark tooth necklaces can all be found here. 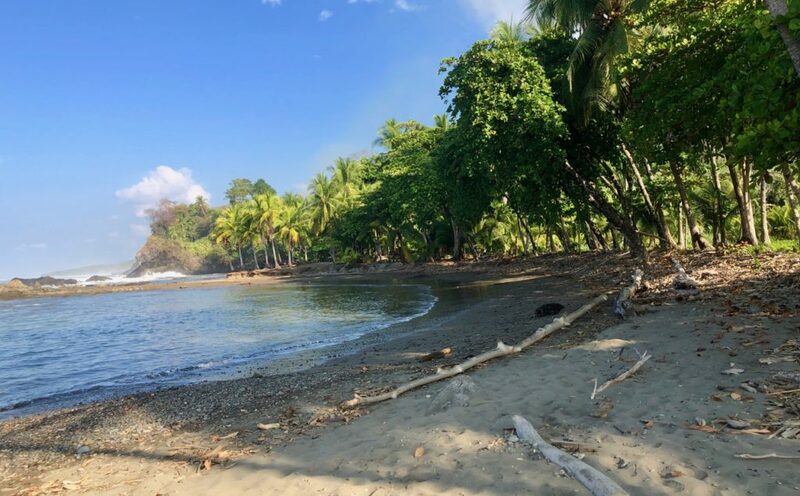 This quiet beach is just south of Dominical and has two entrances. Little signs marked “Playa Dominicalito” will lead you off the main road to this long crescent beach. This is a popular place for occasional campers during busy weekends, but generally it’s pretty quiet. The rocky coastline forms a bay, which makes it a good place for little ones to dip their feet into relatively calm waters. At the north end of the beach, there’s a large rocky outcropping, and when the tide comes in the waves pound the area. Signs warn you not to climb the rocks. At low tide, these rocks form tide pools that are perfect for exploring. Be sure to wear water shoes to avoid cutting up your feet. South of Dominicalito is Playa Hermosa. There are multiple other Playa Hermosas, including one up farther north by the party town of Jaco, but we much prefer this one. It features a long, slow slope down to the water, and a rocky cove at one of end of the beach. Here you’ll find a lifeguard, a ceviche stand, a souvenir stand, boogie board rentals, lockers, and showers — great for surfers, or kids who like to watch surfers. Playa Uvita and Playa Hermosa form the two halves of the beachy “whale tail” that makes up Marino Ballena National Park, and entrance to these beaches does require a fee. However, it may be worth it; this area is great for whale watching and known for gentle waves, making it a good spot to the take the whole family swimming. The beaches at the tip of the Osa Peninsula, around Cabo Matapalo, have turquoise-water-palm-trees-sea-turtles-swimming combo that makes up every beach-lovers dream. Cabo Matapalo makes up the very tip of the Osa Peninsula, and it gets pounded by waves, making this a popular spot for surfers. There aren’t a lot of calm waters around here, but the beaches have light sand, lots of palm trees, sea turtles, and manta rays swimming in the waves. Playa Pan Dulce is one stretch frequently used by surf instructors for learners; the waves here can be good for beginning and intermediate surfers, depending in the day and the tides. Playa Carbonera is better for small children. Pools develop around the rocks here at low tide. Warning: driving here is not for the faint of heart. The unpaved, rocky road is narrow and twisty and requires a high-clearance 4WD even in dry season. Look for small openings in the trees, just big enough for one parking spot, which will lead to the beach. 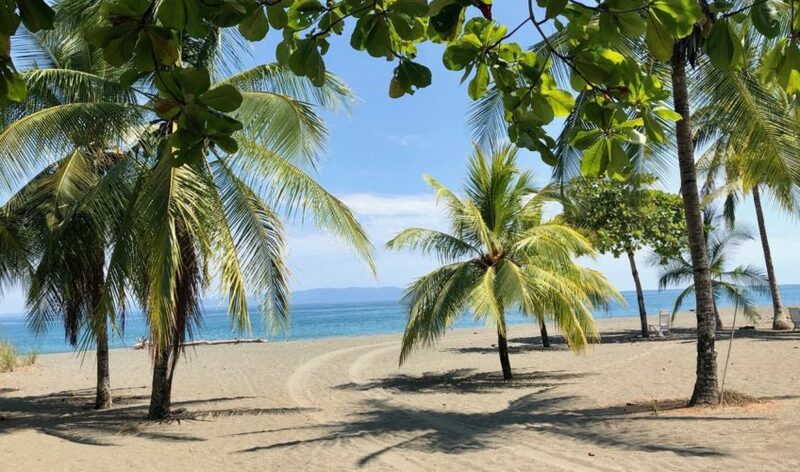 If you’re using Puerto Jimenez as a base for exploration of the Osa Peninsula, Playa Plantanares is a good beach to visit as it’s just a few miles south of town. This is a very long stretch of secluded beach, perfect for long walks. At low tide the swimming is good, although at high tide the undertow can be rough so be careful. This beach is lined with almond trees that are popular with scarlet macaws, and you can frequently see pairs of the bright red birds flitting in and out of the trees. Playa Plantanares has a couple lodges and hotels along its shores, and access is easiest in front of Hotel Agua Dulce, which also has a bar/restaurant you can visit. The access road is all sand so it’s best to have a 4×4 vehicle. The perfect, quiet, undeveloped crescent of Playa Carrillo makes it a welcome respite from busier beaches; you’ll find many locals here on weekends and holidays. Playa Conchal, or “Shell Beach,” is a shimmery beach made of tiny shells. It consistently makes everyone’s lists of the best beaches in Costa Rica, and is quite popular despite how difficult it is to access. There are two resorts on this beach: The Westin Conchal and W Reserve Conchal. If you are not a resort guest, you’ll have to approach Playa Conchal by walking from the adjacent Playa Brasilito. Word on the street is that it’s worth the effort (although I’m not sure if that would be true with my 3-year-old in tow…) You can read a good guide with directions to this beach here. Playa Flamingo is another one of Costa Rica’s famed northern beaches; this one has sand that turns a pinkish hue a few times a year. The beach forms a mile-long crescent around the bay, and is host to many water activities, including fishing, boating, snorkeling, and diving. This area is surrounded by luxury condos and resorts. If you’re not staying in one of these places, you may want to consider visiting one of Costa Rica’s many other amazing beaches. Nosara is know for it’s hippie, health-conscious yoga-retreat vibe as well as its surfing beaches. Playa Nosara is a lovely dark-sand beach. Playa Ostional is home to the world’s largest nesting site for Olive Ridley sea turtles, and Playa Guiones is the area’s longest beach with waves for beginning to advanced surfers. This spectacular white-sand beach is lined with palm trees and shallow waters and adjacent to a cute beach town. It’s touristy enough that you can rent boogie boards or kayaks, sign up for surf lessons, or eat at a trendy restaurant on the beach, but you won’t find large resorts. It’s perfect for people who want to be off the beaten path but not too far off the beaten path. The next beach down from Samara is Playa Carillo; just as pretty but much less developed. This lovely beach surrounds a calm bay and is a popular place for locals on the weekend. There’s parking along this beach but no businesses. 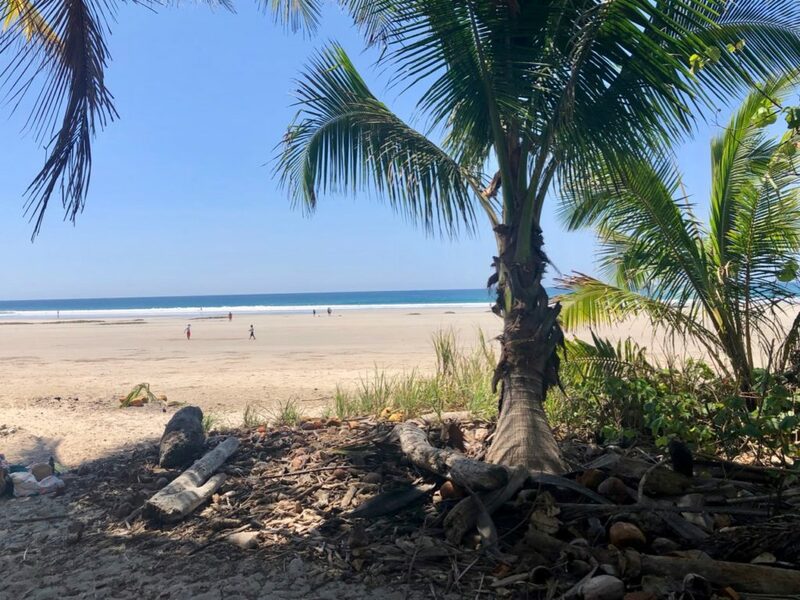 Playa Hermosa on the Nicoya Peninsula is a wide, flat, perfect beach, shaded at the edges by palm trees and boasting waves for every level of surfer. Santa Teresa has long been famous as a surfer town, but as more and more roads on the Nicoya Peninsula have been paved, the town has grown. If you want to watch the surfers, go ahead and join all the other people, otherwise, head to a quieter adjacent beach. 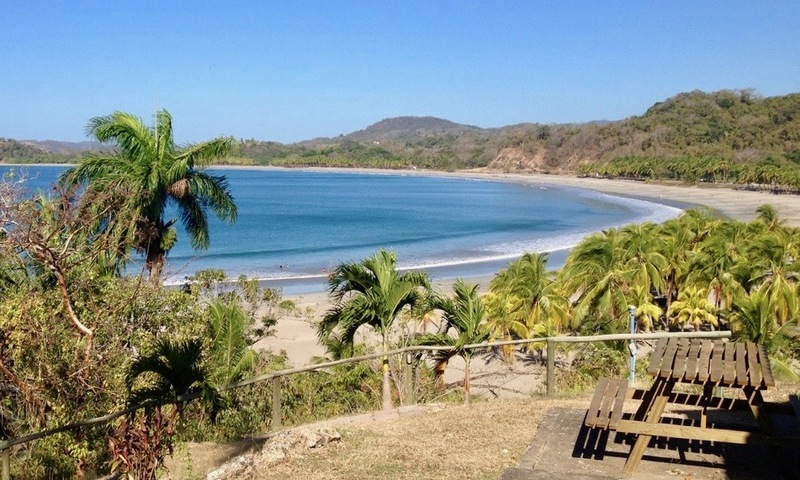 If you sign up for surf lessons in Santa Teresa, they’ll probably take you to Playa Hermosa. Once you get there, you’ll see why. This fantastic wide, flat, gorgeous beach has waves that are just right for beginning surfers. You won’t be completely alone, but it’s noticeably less crowded than Playa Santa Teresa. The sand is soft, but there are interesting large rocks scattered along the sand; at low tide they form perfect pools just right for kids to splash in. If you’re looking to get away from the crowds, head north a little farther and stop at Playa Manzanillo. The beach is rocky in some spots, but it’s wide, basically empty, and had perfect boogie boarding waves safe for our whole family the day we visited. Montezuma is known as an artsy, aging-hippie type town, and we loved hanging out here with the kids. It doesn’t have long, wide surfing beaches like those around Santa Teresa, but it does have tide pools, hidden coves, and fun restaurants and bars on the beach. It was in Montezuma that we managed to spend a couple hours drinking two-for-one tropical drinks from a chill bar while watching our kids climb coconut trees on the beach below, which is basically my idea of a perfect vacation. I haven’t made it to these beaches yet, but they’re on my list…from what I have heard these are the best of the best. If you’re thinking “I just want the picture-perfect white-sand beach, lined with palm trees and jungle, and not too many tourists sharing it with me…” consider heading to this Caribbean beach just north of the Panamanian border. It’s picture perfect. Tortuguero National Park is not easy to reach. You can’t drive there as access is only by boat. But once there, one of your rewards will be the long, pristine beach of Playa Tortuguero. Leatherback turtles nest here every year, and if you want to see them, check on the season before you go. Just outside Puerto Viejo you’ll find this popular soft-sand beach, with palm trees and Caribbean-blue water. 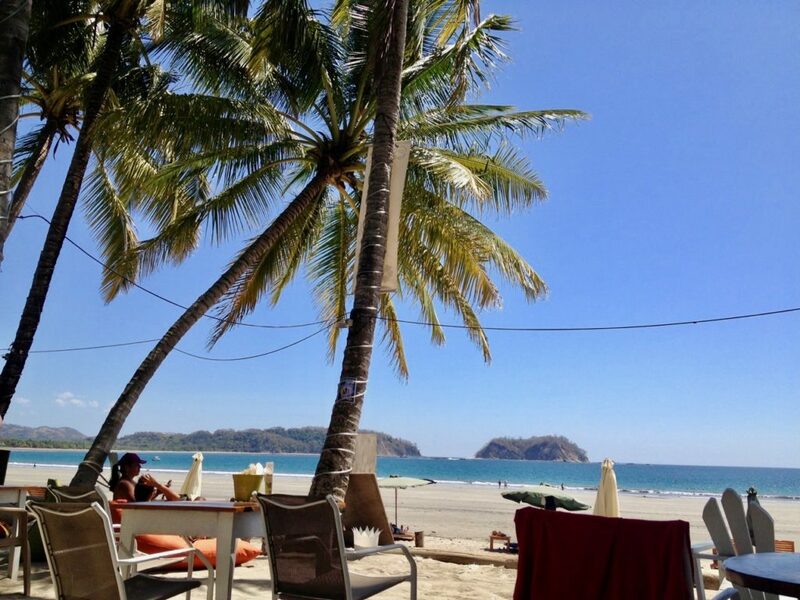 Last but not least: the best beach of all in Costa Rica is the beach you stumble upon yourself. This might sound like a cop-out, but Costa Rica has many private little spots where sand, surf, and jungle meet, making you feel as though you are on a movie set. If you happen to find one of these delectable spots, you are likely to have it all to yourself. On our last trip, we happened to follow signs to Playa Rincon de San Josecito near Drake Bay on a total whim. We were sure glad we did, even if the only other people there, a couple camping in hammocks on the beach, probably weren’t happy to see us. If you are driving around Costa Rica, don’t miss the opportunity to find your own little slice of paradise. The “rich coast” of Costa Rica always lives up to its name!